Her mother was a hired nanny and her father the Mellwood Bank. This is the way Taurus Laurel Richmond describes her family. After burning out as a nurse with an international health agency, she returns to Eastlake, the one place she where she felt connected. She studied nursing here and made a number of friends. Her one problem is her wealth. Soon she will receive a fortune. But money hasn’t given her the things she wants, a home, a family and love. Since a chance visit after summer camp with a friend made there, her idea of a man to love has been Alex Carter. Alex Carter is a Scorpio, a single dad with a five year old son. He’s a general practitioner at Eastlake Community Hospital. While attracted to Laurel, he has one problem. His ex and now dead wife had a lot of money and little sense. Drugs and her fast friends were her life. She abandoned their son who cried for hours until his father returned. Alex has no love for women with money. Attraction or not he refuses to admit he’s falling for Laurel. With the help of Alex’s son, Laurel sets out to prove to Alex she’s in town for the long haul and she will make the perfect wife and mother. Janet Lane Walters has written a charming tale. As a child, Laurel Richmond was trapped in a car with her dead parents for hours. After losing them, Laurel’s next of kin was a bank. 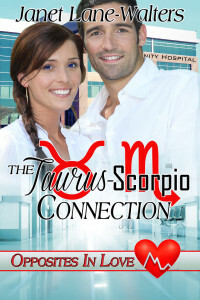 Laurel hides her immense wealth, traveling internationally as a nurse, helping the sick. She decides to settle in Eastlake, a small community. She once summered with her friend Megan, developing a huge crush on Megan’s brother, Alex, who is now a divorced doctor raising his young son Johnny. Alex is leary of wealth because his rich ex-wife had no time for him or Johnny, but Johnny takes to Laurel right away. The glimpses of a family life that Laurel experiences with Johnny and Alex leave her longing for her dreams to become reality. Can she get Alex to realize that money may bring power, but love offers peace?